One of the things that I love about the options straddle strategy, is that it's non-directional. This means that you can make money without forecasting market direction. In other words, it doesn't matter whether the stock price goes up or down in the near future - you can still make money either way - as long as it moves somewhere. 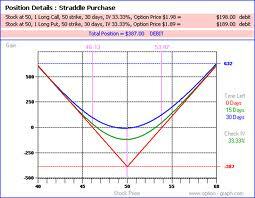 Since most stock prices are on the move, this means that the Straddle options strategy is worth taking an interest in. You can start with this video, or if you're more of a reader, you'll find the script, plus diagrams, below the video. Enjoy! The idea behind a straddle is that you simultaneously purchase the same number of call and put options, with the same expiration date. The plan is, that thanks to option implied volatility and an option greek called "the delta", the profit from the winning option will more than compensate for the loss on the losing one, with a good overall profit being realized. The options straddle trade is a "slow moving" trade that can take anywhere from a few days up to a month to do its thing. 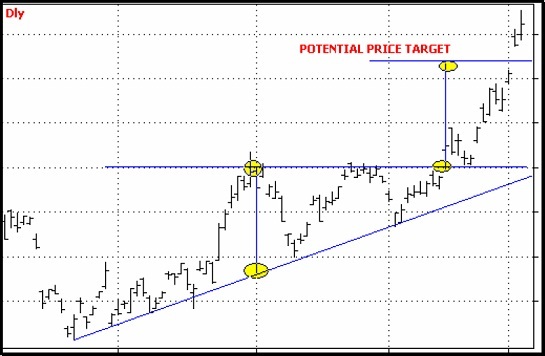 It works best on stocks that are in a period of price consolidation with the expectation that a breakout followed by significant price action may be coming soon. If you are a technical trader, one of the best chart patterns I have found for straddle trade setups, are what are commonly known as "triangle" or "wedge" formations. This is where the recent highs and lows of the daily bar charts are coming together. In other words, the highs are getting lower while the lows are getting higher, so that if you draw a trendline over the highs and lows, you'll see them converging into a point. You'll see an example of a triangle pattern (ascending triangle) further down this page. You want to trade an options straddle as near as possible to the convergence of the two trendlines, even at the point where the breakout begins will still work. The best straddle breakouts come after you see this pattern forming for about 3 months. Anything shorter than that, may result in a breakout that doesn't have sufficient momentum to give you a decent profit. Another vital thing when taking out options straddle trades, is that you need to ensure that the options you buy have at least 90 days to expiration. If you do this during a period of price consolidation, such as in the triangle pattern above, the option prices are likely to be the cheapest around that time, due to low price volatility. This is ideal for straddle trades. The downside of options straddle positions is that they cost more to enter, than other trading strategies such as spreads. Nevertheless, on markets where option contracts only cover 100 shares, they are still quite affordable. If cost is a barrier to you, you might like to consider an alternative strategy called Victory Spreads. A double Victory Spread - done with both calls and puts, achieves exactly the same result as the options straddle but only risking a pittance by comparison. You also want to avoid stocks that are historically slow moving, because the whole idea behind a straddle is to anticipate a short term price breakout that moves far enough before expiration date, to give you a net profit. Another indicator that a price breakout could be imminent, is an upcoming earnings report, say, in about 2-3 weeks. When an earnings report is pending, pay attention to the implied volatility, as option prices tend to become more expensive just before an earnings report is released. Alternatively, a large movement in the overall market due to current econonmic conditions can also affect individual stocks - but under general volatile market conditions you might be better focussing your straddle play on index related ETFs such as the SPY. Coming back to "triangle" patterns, there are three main types. Where the highs and lows are converging, this is called a "symmetrical triangle". However, you often see the lows getting higher, but the highs being equal because they are hitting a resistance level. This is called an "ascending triangle" (see example below). The reverse of this is the third type, namely, descending triangles. These are ideal conditions to implement a straddle strategy. The final thing you want to check before placing your options straddle position, is the "implied volatility" in the option prices, compared to the "historical volatility" of the stock price. Ideally, the former should be lower than the latter. Any decent options broker will be able to provide this information. Wading through a long list of stock charts to try and find triangle patterns can be a very tedious process. But if you have software or a broker service that allows stock scanning, you can make the process much quicker. There is an indicator known as the ADX, or "Average Directional Index". It is usually used in conjunction with the +DMI and -DMI indicators, but for our purpose we can ignore these. The general rule is, that when the ADX crosses above 15 the market is likely to break out. Below 15 the market is consolidating. So if you, or your broker, have a scanning facility, you would set your stock price filter to between $20 and $10k and your ADX filter to crossing above 15. It will produce a list of stocks that qualify for both parameters. 1. Earnings Reports - Options Implied volatilities should be lower in between company earnings reports, as there are no major announcements or conferences expected which might energise the price action. If you're scanning the market for straddle trade opportunities, you should begin your search by looking at stocks with upcoming earnings reports during the next fortnight. 2. Looking at a bar or candlestick chart of the underlying, you should be able to observe price consolidation. Comparing the size of the current daily bars with those in the past, it should be apparent that these bars are smaller than the historical ones. You want something that has had big moves in the past (which indicates that this stock's price DOES move) but now the price action is relatively quiet due to smaller intra-day price moves. In consolidation mode stocks also tend to have lower volumes. Under these conditions the options will normally be cheaper. You will often find this phenomenon close to the end point of a "triangle" chart pattern, as described above. 3. The options must be cheap. By "cheap" we mean that the implied volatility in the at-the-money option prices must be less than the historical volatility of the underlying security. Any good options broker should be able to deliver this information. For example, with OptionsXpress, you can look at a price chart in "Volatility View" mode and easily compare IV with HV. If all the above conditions are in place, you have an ideal setup for an options straddle trade. The Options Straddle is one of the safest and most stable option trading strategies available, because you've eliminated the need to predict market direction. It does have some risk, namely, that the stock goes nowhere, in which case, time decay (theta) on your bought positions will work against you. But if you've purchased when the implied volatility is low and price is cheap, your losses will be minimal. Straddle profits are theoretically unlimited, but anywhere between 20 - 50 percent per trade is quite easily attainable.